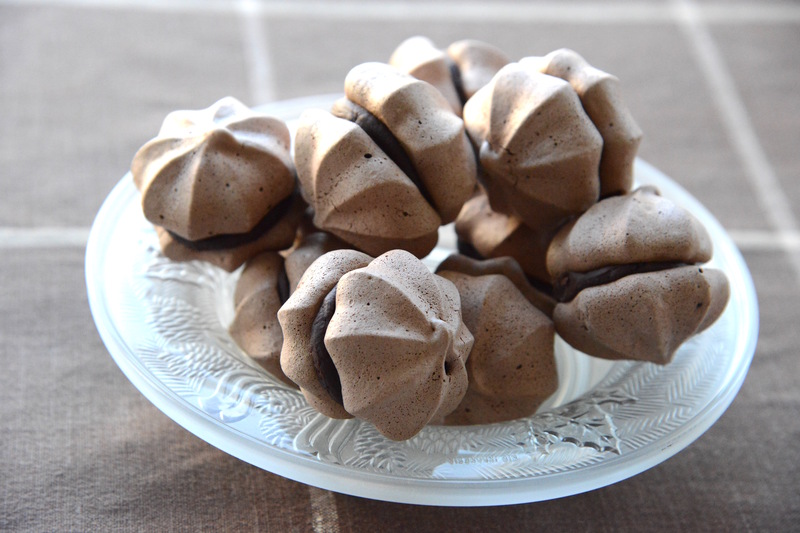 If you enjoy the delicate crunch of meringue and the creamy texture of a chocolate ganache, you’ll love these sweet bite-sized morsels. The meringue is made by warming egg whites and sugar before they are whipped. This technique, called Swiss meringue, offers better stability than a standard cold whipped meringue. The addition of coco powder cuts the sweetness of the meringue, which made me want to add even more chocolate: a dark ganache filling laced with peppermint essence. Makes a superb after dinner treat with coffee and Grand Marnier. If you’re going to splurge, you may as well do it right. In the bowl of a standup mixer, or a large bowl, whisk together egg whites and sugar, to combine. Bring a saucepan of two inches of water to a simmer and place the bowl over the saucepan (the water should not touch the bowl). Whip the egg whites and sugar until the mixture is warm, about 120 F (50 C). The idea is to dissolve the sugar, not create volume. Remove from heat and whisk the egg whites with an electric mixer at high speed until stiff peaks form and the meringue is completely cool. Gently fold in the coco powder and mix just until incorporated. Place the mixture in a piping bag fitted with a star tip. Pipe 1 1/2” rosettes onto the prepared sheet. Bake for about 40 minutes, or until firm. Cool before filling with chocolate ganache. Chop the chocolate into small pieces and place in a small, heat-resistant bowl. In a small saucepan, heat the cream until it just comes to a boil. Pour the cream over the chocolate and stir until smooth. Add a few drops of peppermint extract. When the chocolate has cooled and thickened to a spreadable consistency, spoon about a teaspoon of ganache on the flat side of half the meringue cookies. Top with another meringue cookie, flat side facing ganache. You’ll have leftover ganache (as if that’s a problem); it’s difficult to make a smaller batch.